Beaumont Health is Michigan’s largest health care system (based on inpatient admissions and net patient revenue) formed in 2014 to provide patients with extraordinary, compassionate care, no matter where they live in Southeast Michigan. With eight hospitals, 168 health centers, nearly 5,000 physicians and 35,000 employees, Beaumont Health contributes to the health and wellbeing of residents throughout southeast Michigan and beyond. As a part of Beaumont Health, Beaumont Hospital – Wayne offers high-quality care to the community with compassionate service and state-of-the-art technology. Beaumont provides extraordinary care in specialty services including rehabilitation services, cardiology services, imaging services, women’s health services and the Family Focused Birthing Center. The birthing center at Beaumont – Wayne provides private birthing suites for labor, delivery, recovery and postpartum; unique amenities to enhance the entire stay, like comfortable furniture, flat screen TV, and dining on-call menu service similar to hotel room service. Beaumont also offers informational and educational classes for new parents including breastfeeding, infant care, CPR and more to help you be the best parents to your newest little family member. Beaumont – Wayne also offers comprehensive 24/7 emergency care as the only hospital in the Wayne, Westland, Garden City, Inkster and Romulus area that is verified by the American College of Surgeons as a Level III Trauma Center providing prompt assessment, resuscitation, surgery, intensive care and stabilization of injured patients. The Beaumont – Wayne emergency room was recently renovated and offers Fast Track Service for rapid assessment and care for less urgent conditions. Also in the area is the Beaumont Health Care Center – Canton emergency room, which has had over 90% patient satisfaction ratings for 5 years in a row and is the only ER in Canton. As a part of Beaumont Health, patients at the Beaumont Health Care Center – Canton ER receive the full benefit of the Beaumont hospitals. 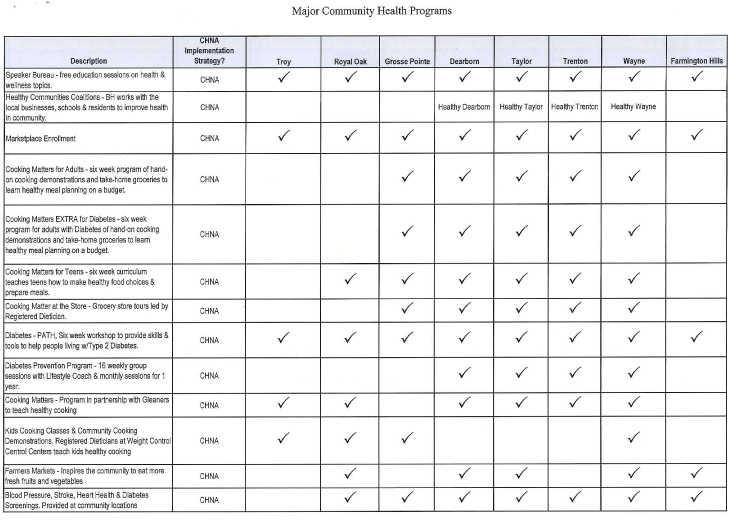 Beaumont offers many programs in the Wayne area to keep community members healthy and informed. 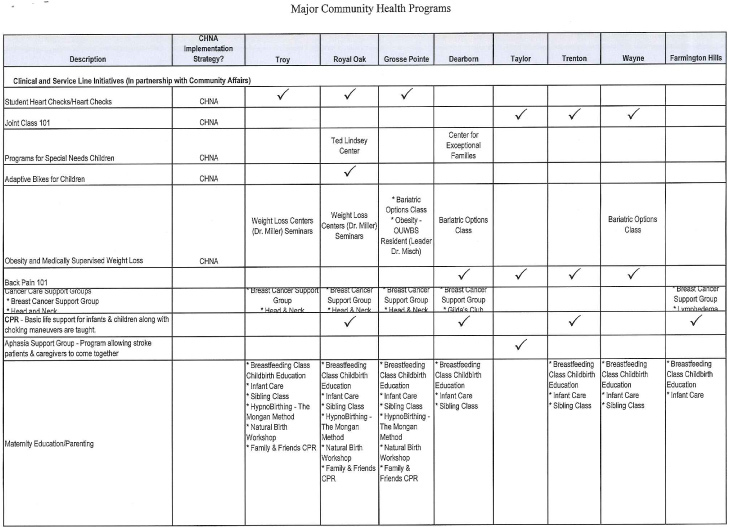 Classes and events offered include free heart health and diabetes screenings, diabetes educational programs, federally certified health insurance navigators and more. You can learn more about upcoming classes and events at	oakwood.org. By recognizing the linguistic and cultural needs of the growing elderly, ethnic and racial minority populations, Beaumont succeeds in creating environments where individual differences maximize the collective capabilities as a team Beaumont is an integral driving force in the southeast Michigan community and thrives on its commitment to diversity and respect for all patients. Beaumont strives to create an environment of care that welcomes diversity and respects and values all persons. This environment is enhanced by the ability to respond respectfully and effectively to people of all cultures in a manner that recognizes, affirms and values individual differences and similarities while preserving the dignity of every person. Call 800-543-9355 to schedule an appointment with a Beaumont physician or to learn more about the programs and services available in your neighbourhood.